To became the best selling Smartphone maker, Micromax India has launched all new Micromax Canvas Play 4G along with Canvas Blaze 4G, Canvas Fire 4G on Thursday. 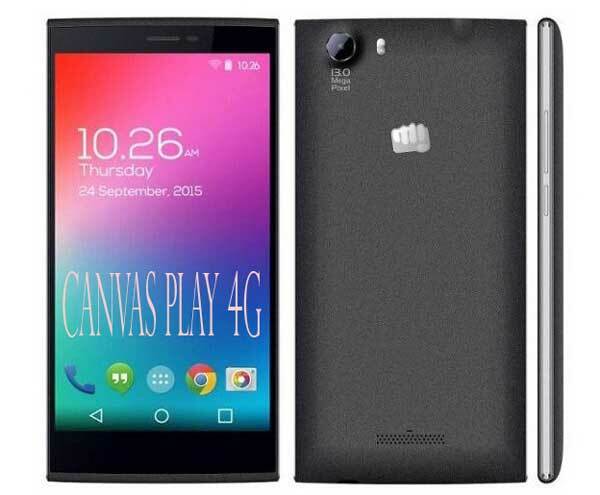 Micromax Canvas Play 4G is available online and in stores priced at Rs. 12,499 while Canvas Blaze 4G, Canvas Fire 4G both will cost you Rs 6,999. The all new Micromax Canvas Play 4G supports Dual-SIM((4G+3G)), Micro SIM, Bluetooth 4.0, Micro-USB, Wi-Fi , GPS, and a 3.5mm runs on latest Android 5.1 Lollipop and powered by a powerful 64 Bit, quad-core Qualcomm Snapdragon 410 (MSM8916) processor clocked at 1.2 GHz offers you blazing multitasking and 2GB RAM, 8GB internal memory and 16GB Expandable memory offers you enough space to store your data. Micromax Canvas Play 4G offer you a 5.5-inch HD IPS display with resolution (720×1280 pixels) and Gorilla Glass 3 protection with side angle HD viewing offers you crystal clear display even in bright sun light While 13-MP rear Auto focus camera with LED Flash, Sony IMX135 CMOS Sensor and 5-MP front facing camera offers you superior photography in low-light condition and amazing selife experience powered by a powerful 28200mAh Li-Po battery. At last few honest word to say that Micromax Canvas Play 4Gis coming to rule the budget phone market. What you think? Please be first to write a review.